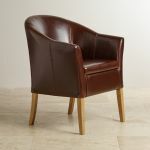 This stylish Brown Leather Tub Chair is upholstered in premium grade leather with handcrafted solid oak legs. 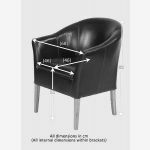 Perfect in the living room or study, this bucket chair would also be great for commercial use as an occasional chair in a bar or reception area. Comfort, style and durability in one tidy package - and all for a surprisingly low price tag! We never skimp on materials at Oak Furniture Land and we never use chipboard, MDF or veneers in any of our products. Did you know? The tub chair boasts a rich history. 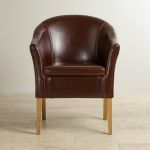 During the nineteenth century, tub chairs were known as club chairs and were commonly found in clubs where men could relax, engage in conversation and enjoy a drink or cigar. Tub chairs remain very much in vogue today and still represent the perfect balance of style, comfort and durability. The solid oak legs on our Brown Leather Tub Chair mean that this comfortable little seat will complement any of our solid oak ranges - helping you create a wonderfully co-ordinated interior!